It’s the middle of the work week and I’m starting to think I might be going crazy (truth: I’ve been nuts this whole time). 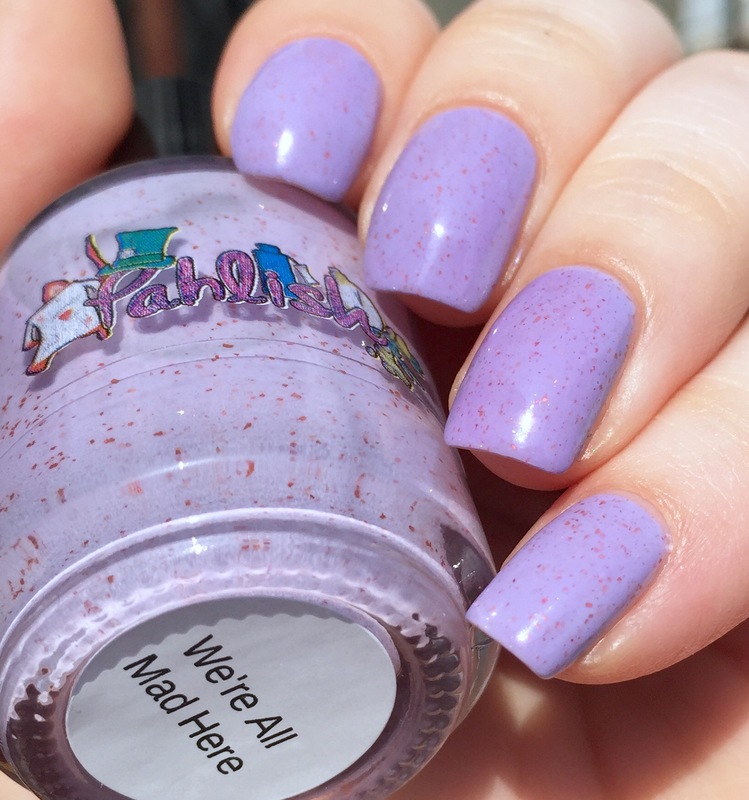 Since I’m going work stir-crazy, I decided to show off “We’re All Mad Here,” from Pahlish’s recent Alice in Wonderland collection. This bad boy is a gorgeous creamy violet-purple with reddish copper flakies. The two photos above were taken in the shade, where this color leans much bluer. The three photos below are in direc sunlight, where it leans pinker. The formula on this is really good. It is on the thinner side, but I didn’t have any issues at all. This is just two coats. Plus, I can tell you it works great for gradients (see here for a gradient look I did with this shade)! Unfortunately, this particular shade isn’t being stocked any longer. 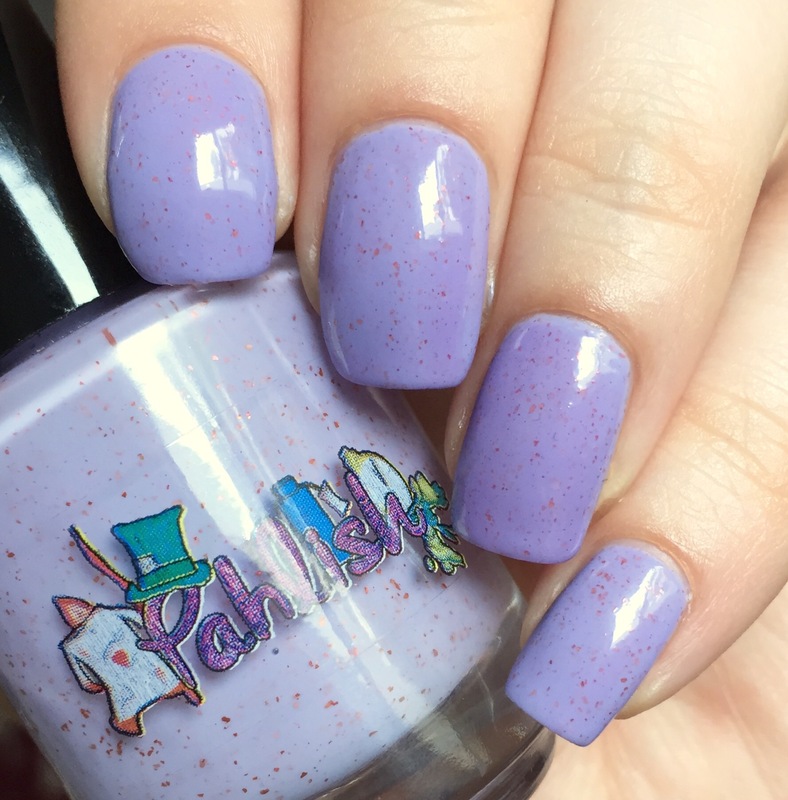 However, Pahlish is always putting out more amazing creme/flakie combos that’ll knock your socks off, which you can find on her website. Also, there’s always a chance that you could score it or something similar through a Mystery Pahlish purchase. This is such a delicate polish. I *love* the name! Ughhh absolutely love this!!! Gorgeous swatch!! Gorgeous swatch and gorgeous color! I really like the copper flecks. Quite unusual. Love the name of this polish! And those copper flakies are perfect in the dusty base.